Good morning and happy Reveal Eve! Before we turn the calendar and begin the lovely month of October, I want to share a simple technique that was inspired by this image I found on Pinterest. First, I took a sheet of 8.5 x 11 kraft paper, drew my pattern on it using a ruler. and cut it out with my paper trimmer. I then numbered each piece so that I could remember what went where. Often times when I think of a starburst I picture it radiating out from a focal point and had I not seen the image on Pinterest, I am sure I would never have thought to have used it as I did. And here my finish layout. 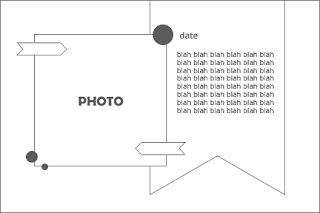 I created a layout about my instagram photos. I change some of the details based on the sketch and I think it's ok. First, I only use three photos here and the rest of it i choosed pretty papers to company my photos. 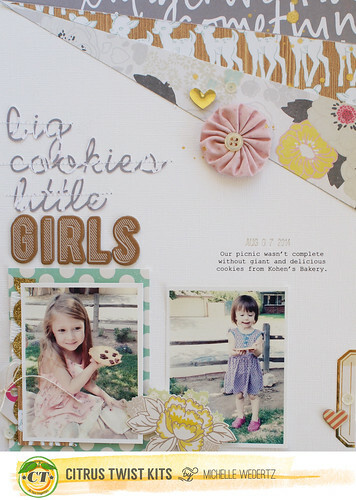 I cuted into square shape and decorate it using pretty embellishments. I pop up all of the photos and square papers to give some dimension. I also change the tittle, I prefer to paste my tittle in the middle of the page and this time I didn't do the journaling part. The bold tittle using brown thicker is enough to pop up the page it self and also to describe it. To play along this week and for a chance to win $5 to spend at CTK store, upload your projects based on this week sketch to the CTK gallery.You have time until Oct 5th and please include "Sketch 9/28" in the description. Hi there and happy Saturday! 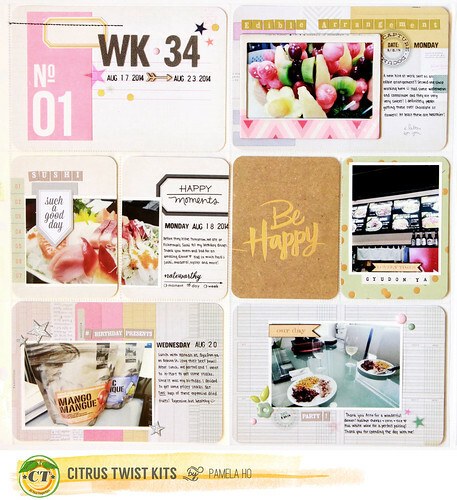 Today I am here to share a free cut file as well as some layout inspiration for you using the September scrapbook kit. Here's a look at the cut file I created. 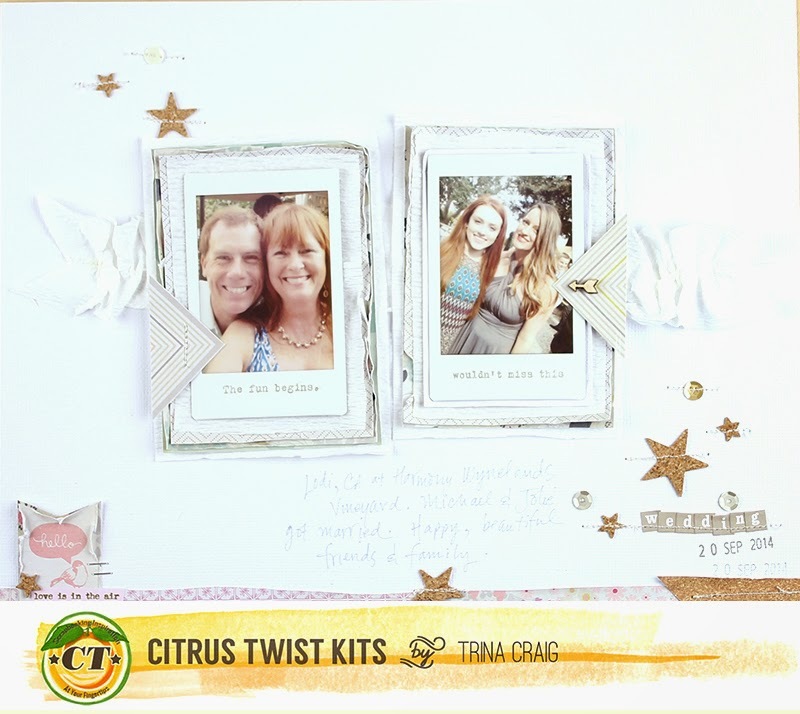 My inspiration was film strip, but I wanted to add some openings for photos and embellishments as well. I added the shapes inside to make it even more versatile. You can download that silhouette file HERE. 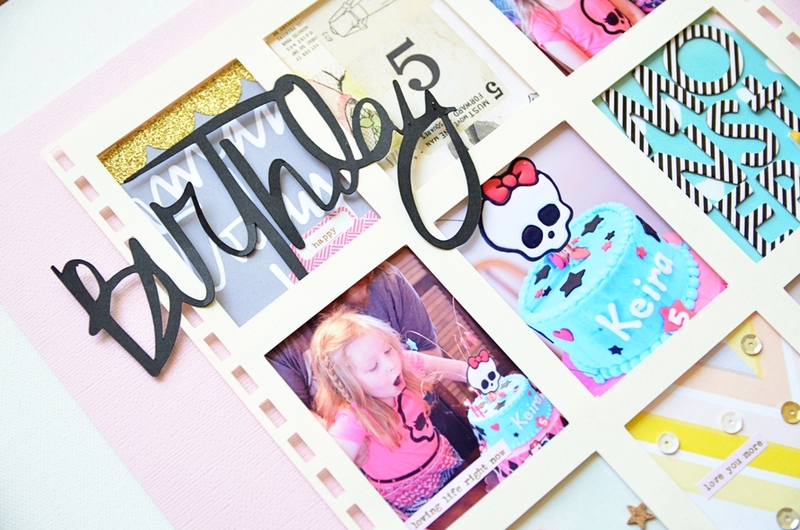 I used foam squares to pop up the frame once I cut it out of vanilla cardstock. Then I printed my photos and added them to the insides of the frame. Thanks for stopping by today! If you make something with the file, I would love to see it! Post it in our new Facebook group - CTK Fan Page. Hello everyone! I'm back with some Pocket Life pages and Handbook pages to share with you! September's kit is so soft and sweet so I really wanted to use them to document the biggest event during the year. 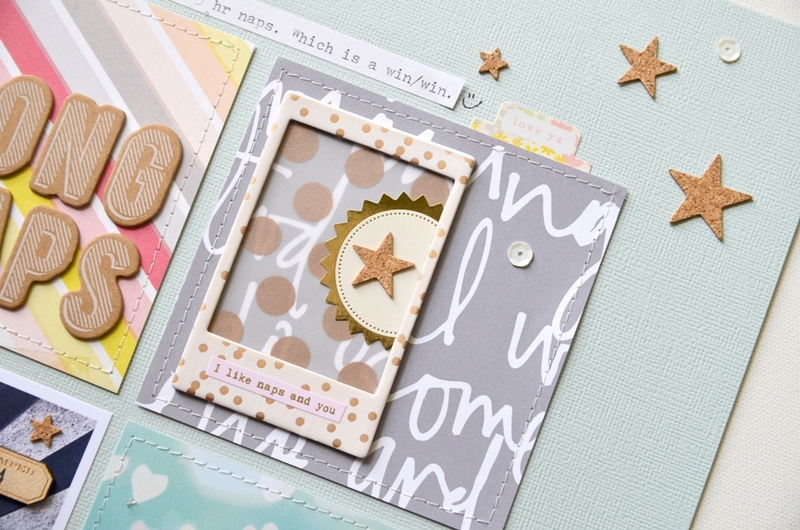 Those journaling cards from Crate Paper in the Lucky Me PL Embellishment kit is my favourite item this month! 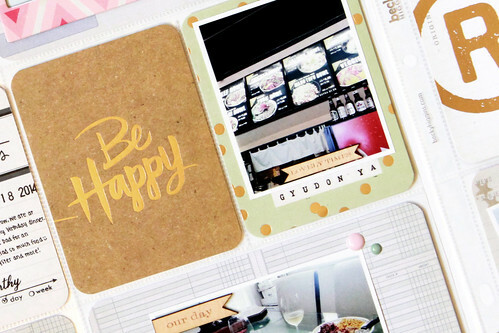 If you're having troubles using it up, don't worry, there are similar designs in the 6x6 split paper pad from A Reason to Smile PL kit. 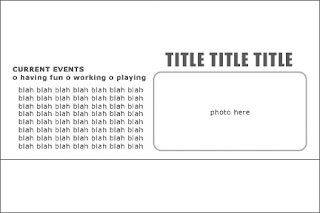 I used one of the journaling card from Crate Paper for my title card. I needed something bold against the soft colours so I grabbed some alphabet stickers from my stash. 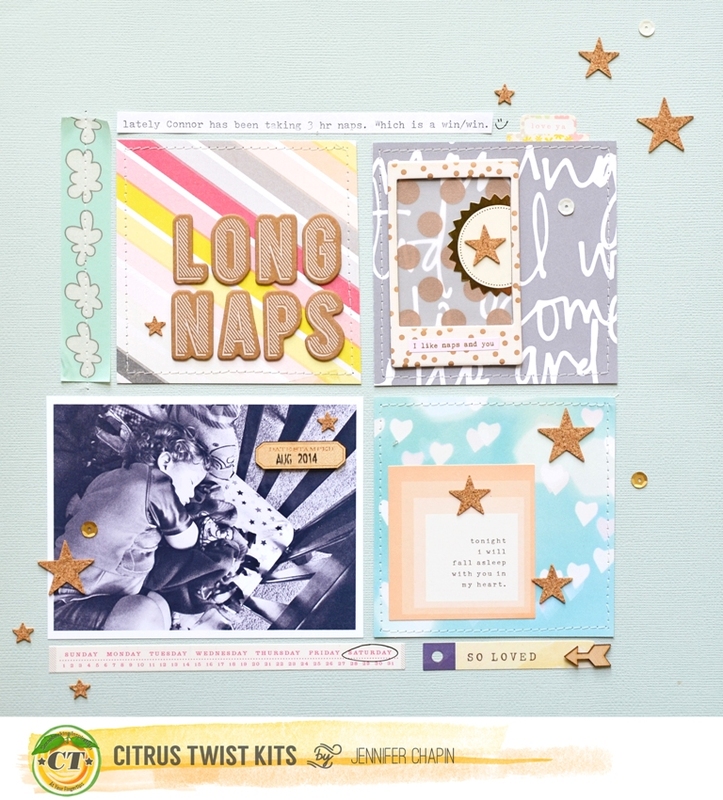 That gold foil on kraft journaling card is to die for! Here is the right side of the spread. 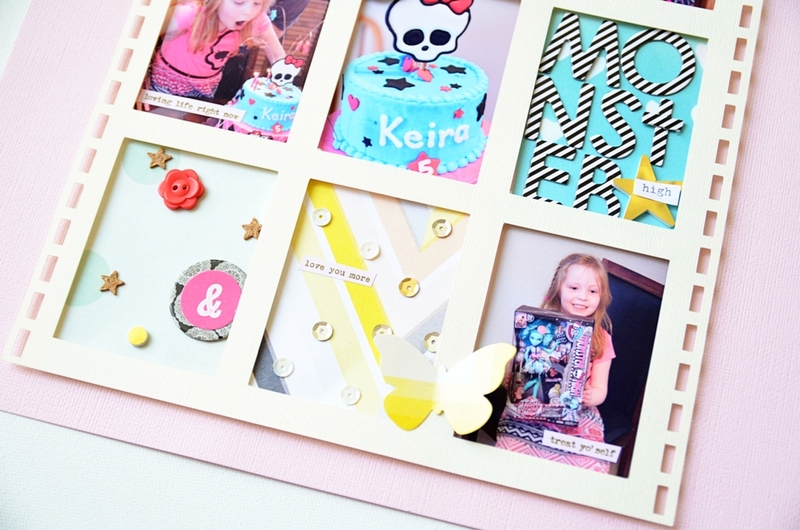 The photo frames from Crate Paper are so fun! I am trying hard to not hoard them! So what was so "big" this week? It was my birthday (ok, it's not really that big of an event!) 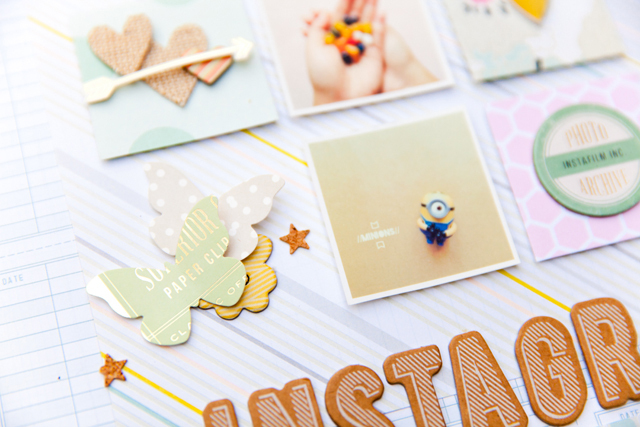 I used the gold foil card from the embellishment kit. When I saw the "20" in the top corner, I added a sticker saying "August" to the side for my birth date. And here are some photos that I took during the unboxing of the PL kit. The new packaging is gorgeous and Trina makes it so personal with a little bag holding all the goodies! I decided to start a handbook to document all my travels. I will be travelling quite a bit this year so I wanted to make sure I have a place to put these special photos. The first trip recorded in my handbook is to Okanagan for the weekend. 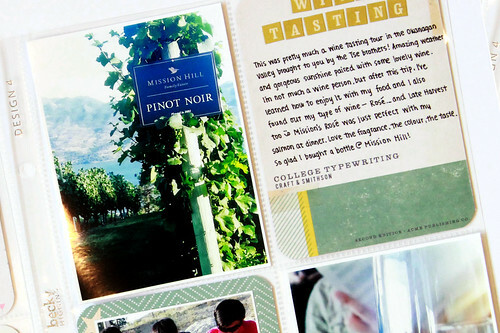 It was an amazing wine tasting weekend! Here's a snapshot of one of the first vineyard when we arrived at Okanagan. Beautiful weather and gorgeous scenery. What a perfect place to be in the summer! And here are your PL sketches from last month and this month! Ever have leftover supplies from your kits that you'd like to use but not sure how? 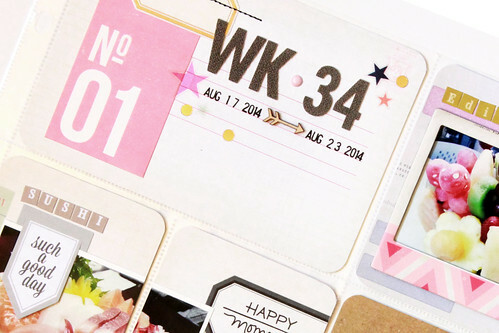 Today I will show you how easy it is to make an art journal page using September Pocket Life leftovers. 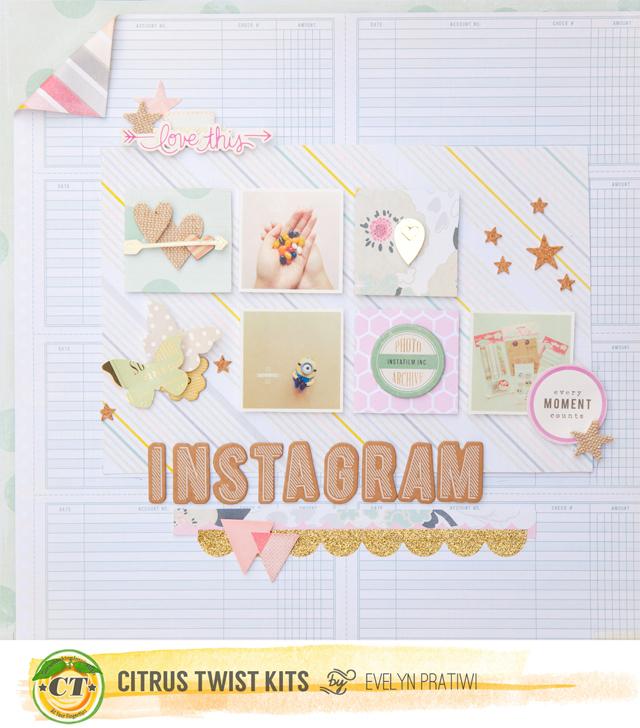 I've created five 12"x12" pages using our September and Add-On kits and still had so many lovely goodies leftover that I wanted to use. Since art journaling is very hyped up right now, I wanted to show you how easy it is to make a page using nothing but the supplies you have left from your scrapbooking kits, some glue and a pen. Ready? Let's take a look! Step One: gather your leftover kit supplies, glue, pen and a blank journal. (any blank journal will do). If you're afraid of "ruining" the pretty notebooks you have, don't be. If you really really can't bring yourself to start on the first page, open it on the second or even fifth page. No stressing, no overthinking. Step Two: pick any card stock paper and rip it in half or so. Glue it down. Do the same with some patterned paper. I usually use patterned papers from 6"x6" packs for my 4"x6" page pockets so I have a lot of 2"x6" trims from that. Step Three: word stickers. 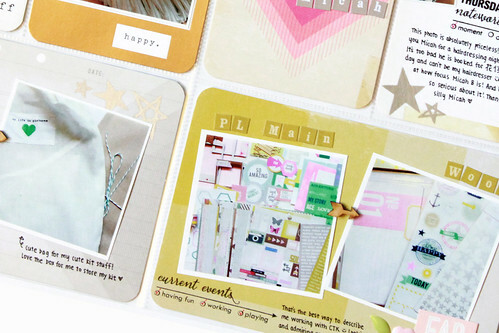 I wanted my page to be sort of an inspirational advice so I picked the words from Shimelle's new line as well as Heidi Swapp's clear stickers that were almost a guidance kind of words. Step Four: non-words embellishments. I added some hearts and arrows stickers, and rub ons. Final Step: Journaling. I decided to write down a little quote that I thought went nicely with the rest of the art journal page and the words on it. I also doodled around the word stickers, almost as if those were steps to take to achieve the happiness given in my quote. And here is a complete art journal page, done with nothing but scrapbooking leftover supplies, pen and glue. 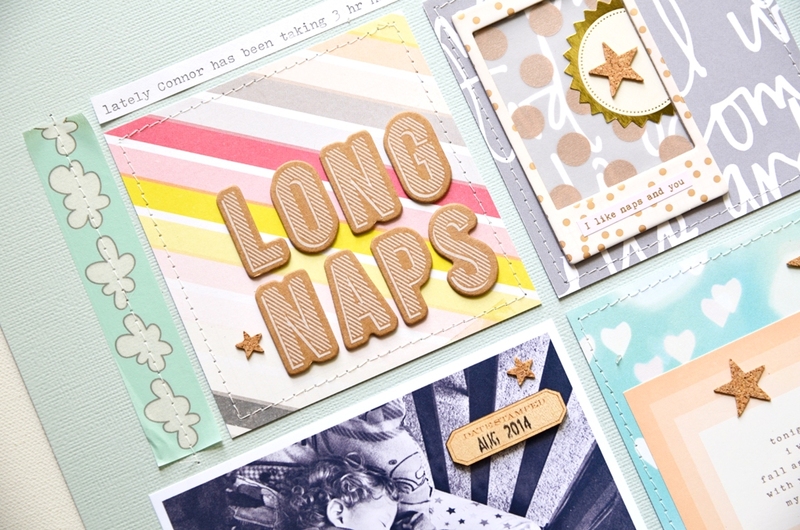 Here's to more ways to use your scrapbooking stash and an upcoming weekend. 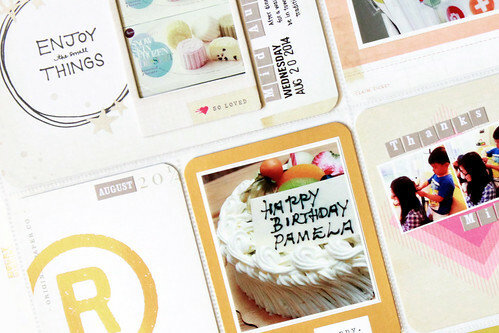 We get many requests from our subscribers and fans for ideas on how to organize stamps. 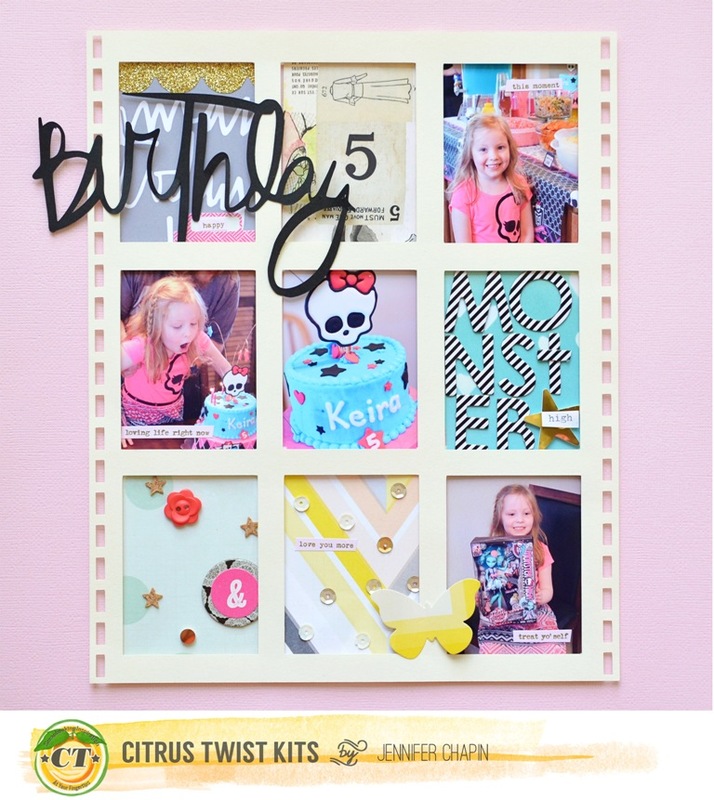 For today's A View from Our Gallery post we thought we would share this video that a subscriber and Citrus Twist Kits Fan Page member Rebecca Kvenvolden made. 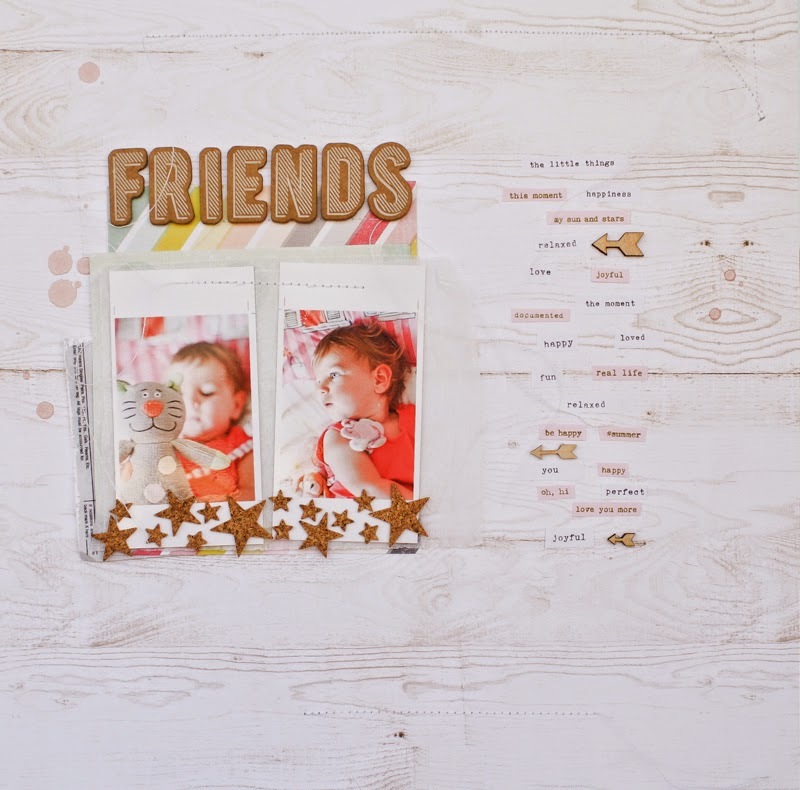 Rebecca has put together this wonderful little film on stamp organization and tips for storing kit contents and embellishments. 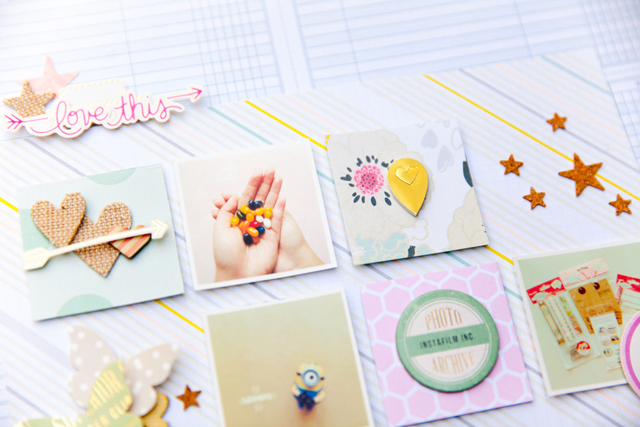 All you need to organize your stamps is a Simple Stories (or Handbook-style) album, 6 x 8, with a variety of sleeve styles plus plain journaling cards to put behind each clear stamp so you can better see what is on each stamp. Thank you Rebecca! We loved seeing this gem of a video. It's Trina here with the Tuesday Tutorial. I'm here to share 6 x 6 paper play with you today. For those of you who have leftover 6 x 6 pads, this is a great way to use that paper. 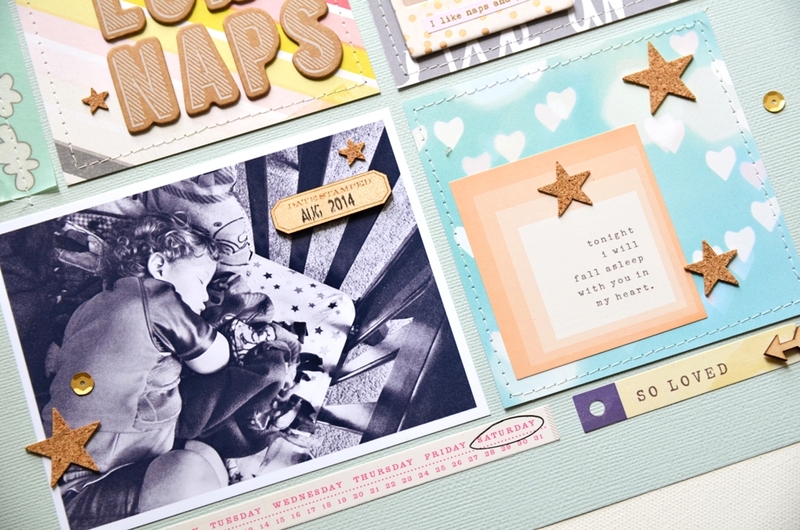 One of my favorite things about scrapbooking with 6 x 6 paper is that I get a smaller version (reduced-size) of the full-size collections that I love. 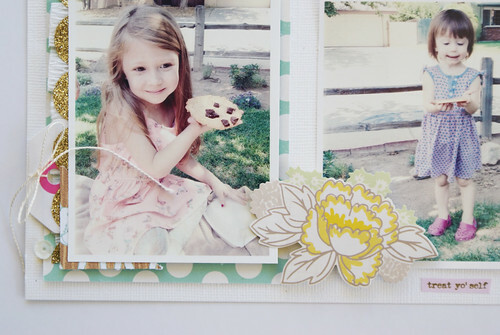 The petite patterns can be just perfect, especially when you use them with small polaroid-style prints like these. 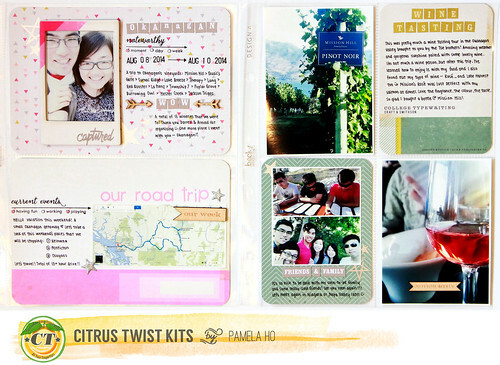 I worked on this layout during a weekend away at a family wedding. I brought my compact Instax printer from Fujifilm to print photos straight off of my iPhone. I use the Instax Share phone app so I can easily access the small portable printer. (The printer easily fits in my purse!) 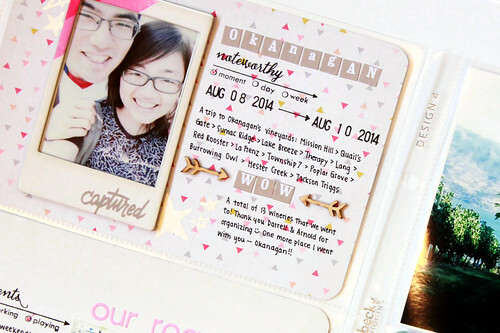 To create my layers I set the Instax polaroid photo over white cardstock and trimmed around the picture. Each layer is slightly larger than the layer above it. 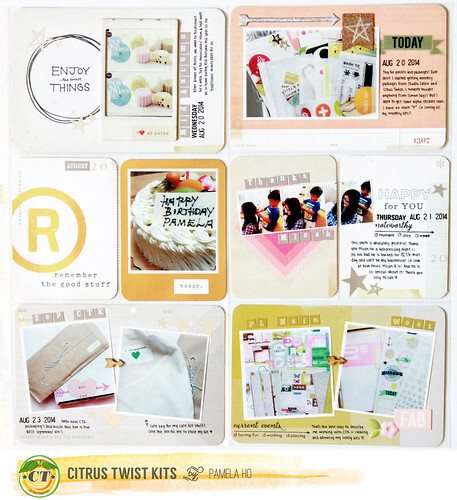 Two of the layers were cut from the white crepe paper that came in this month's Free Spirit Main kit. 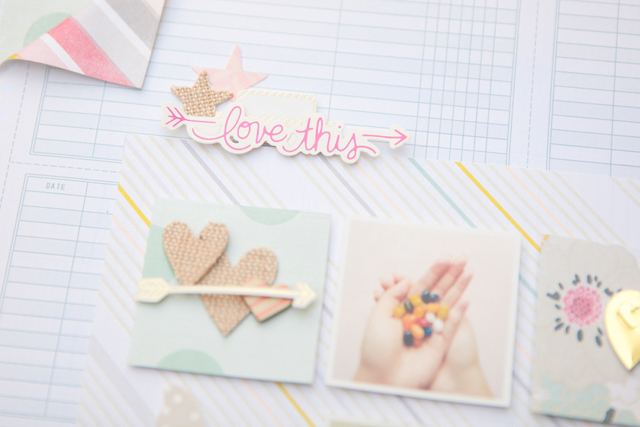 I hope this little layer tutorial inspires you to use your leftover scraps or 6 x 6 paper to create your own easy layers. Hi everyone. It's Elena with a sketch and a layout. I usually use one picture on my layouts but the truth is that narrating a story through a layout is easier if we use two or more photos. And I had those two photos of my daughter playing with her "friends " in bed which were perfect. I liked the sketch very much and that's why I decided to follow it from the beginning to the end. 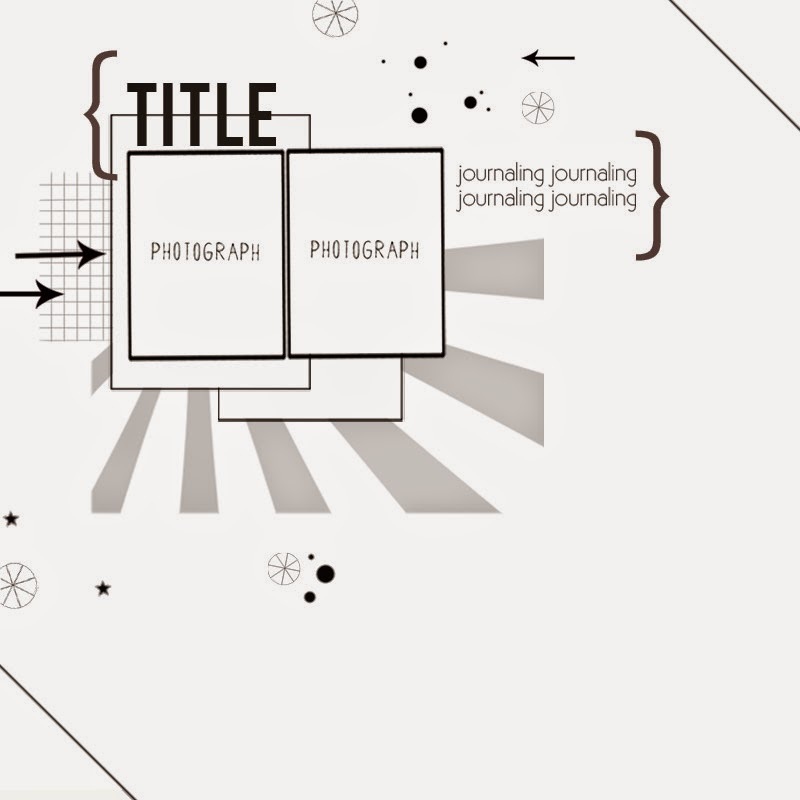 Two photos with title above and the journaling on the right. I intended to trim the white space of the photo paper but decided not to, because I like adding embellishments on my photos but those two were rather small. 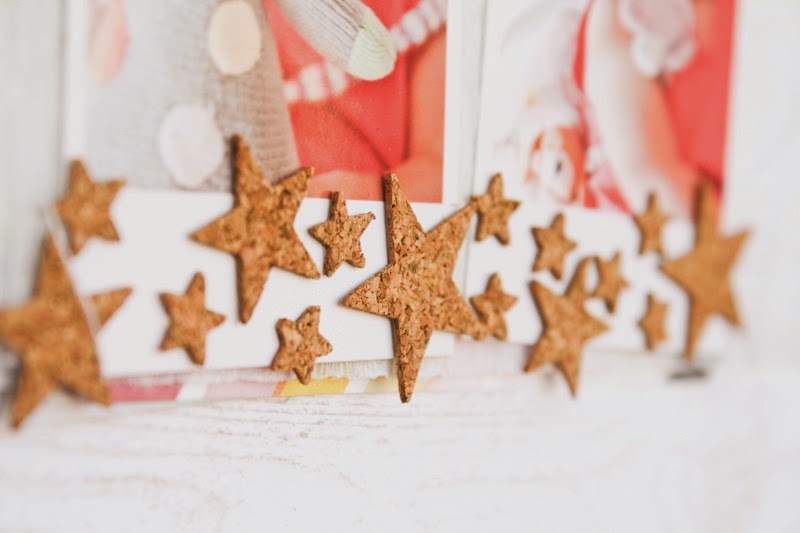 So I scattered the cork stars-one of my favorite elements of the kit- at the bottom. 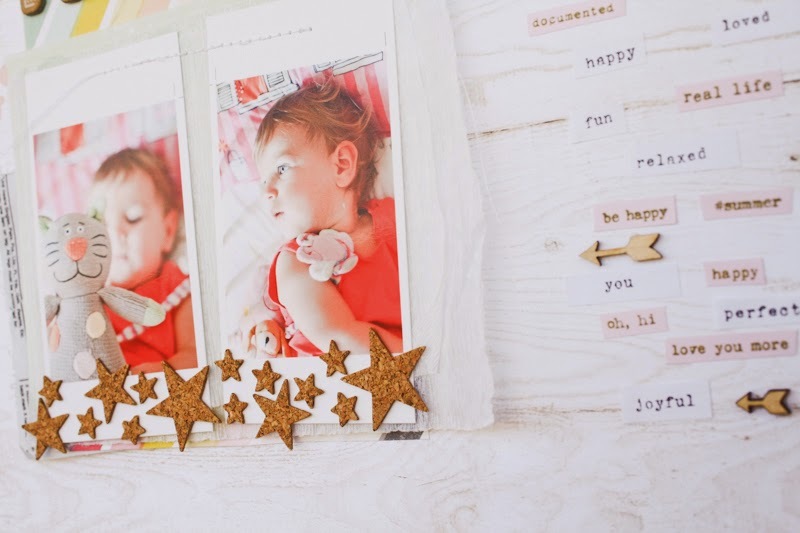 Then I added the title and I loved how the letters and the stars framed the two colorful photos in the middle. 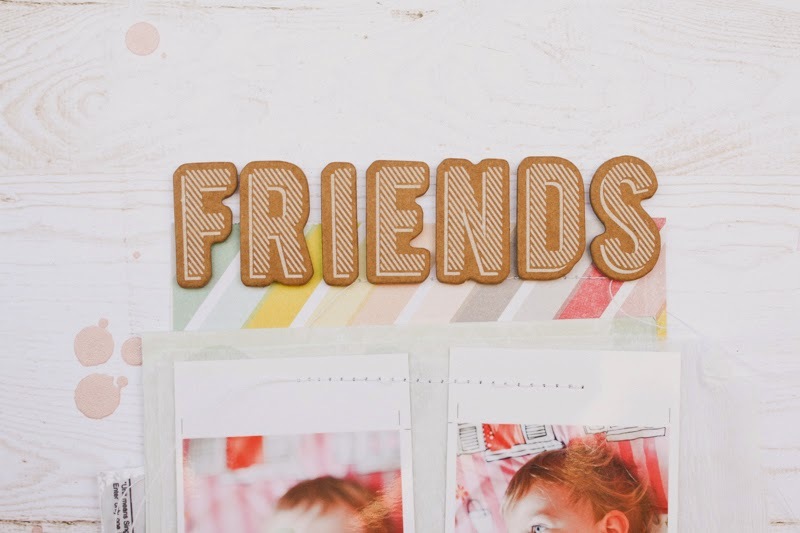 So instead of writing something I used the CT sets of stamps, the SC Brighton Pier tiny word stickers(pink and gold is one of my favorite color combos these days) and the wood chip arrows describe the feelings. And they did a great job! To play along this week and for a chance to win $5 to spend at the CTK Store, upload your projects based off of this week's sketch to the CTK Gallery. You have until September 13th and please include "Sketch 9/7" in the description. Hi there! Jen Chapin here and today I am going to share a photography post with you. 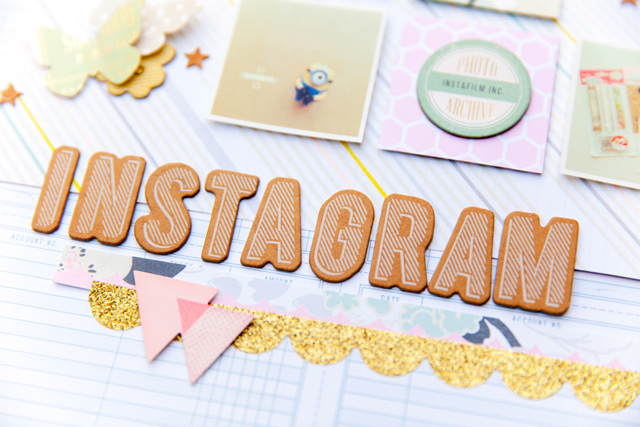 One of the most common questions I get is, "how do you photograph your scrapbook pages?" I'm going to walk you through my process. You will want to find an area in your home that has nice indirect light. I prefer to photograph my layouts during the daytime as natural light shows colors best and whites at their whitest. For me, this is in my front foyer. I choose a time of day when the light isn't shining directly in the door and place my layout on a white canvas. I stand over the layout and photograph straight down. For those of you using a DSLR, my settings for this photo were as follows: f4.5, 1/100, ISO 160. I prefer to use my 17-55 2.8 lens as I can zoom in and out, but a fixed 35 or 50mm lens works as well. The key here is not lowering your aperture too far. If you use a lower f-stop, your layout may be in focus in the middle and blurry around the edges. Also try to use a shutter speed fast enough to compensate for camera shake, unless you are going to use a tripod. If you have good light, an ISO of 160-200 is adequate. Remember, the higher you set your ISO, the more grain you will have so try to keep it in the lower range. Stand straight above the layout and shoot. I take about 5-6 photos so I know that I will have at least one good shot! Here is the image straight out of the camera. As you can see, it is a little dark, but the main thing I am going for here is that the image is straight and the details are sharp. We will fix the lighting when we edit. 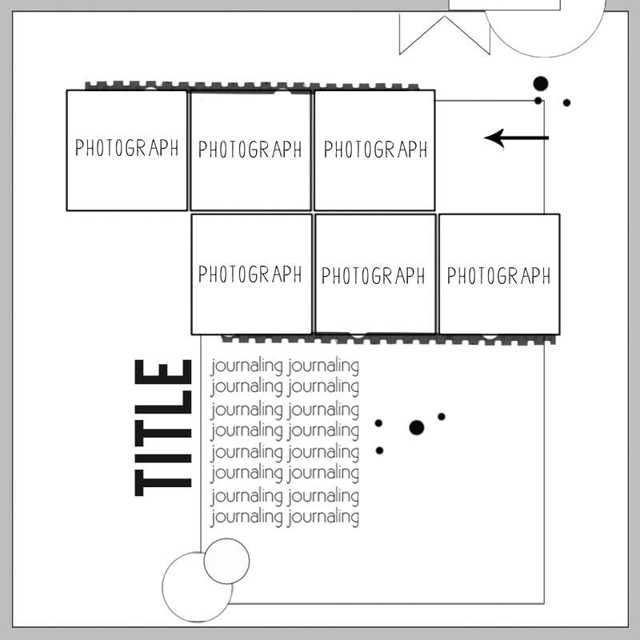 After opening my layout in Photoshop (I am currently using PSE10), I use the crop tool to crop out the white background. You can also take this opportunity to straighten the layout if needed. Next I adjust the levels. Push CTRL+L and the levels box will pop up. Move the sliders until the desired level of lightness is achieved. You can also click on the little droppers and click on the corresponding color in your photo to correct the color. For example, if I wanted to correct the white balance, I would click on the white dropper then click on the whitest part of my page. I also use RadLab, which is a plug-in that can be used with Photoshop and Lightroom. I then open the layout here and add a few filters to sharpen, increase the saturation and the lighting. And here is the finished layout. What a difference, right? I also like to take a few detail shots. For these I get down right next to the layout and shoot a few pictures with a lower aperture, typically f2.8. 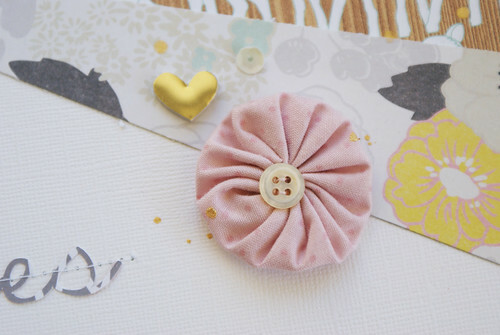 I like to do this so you can see the dimension in the embellishments that I've used. Stitching always shows up beautifully too. Thanks so much for stopping by today! I hope you have a little more confidence now in taking great pictures of your layouts. If you have any questions, leave them in the comments. Have a great day.